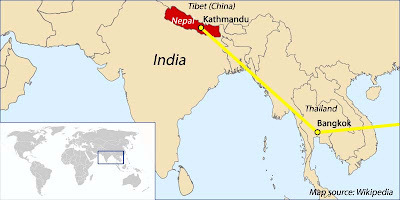 This map, adapted from Wikipedia, shows the first two legs of Audrey's Himalayan trip, reaching the city of Kathmandu in Nepal. The time there is 11 hours ahead of Memphis. For example, 6 PM on Tuesday in Memphis would be 5 AM Wednesday in Kathmandu.